Use the mirrored cup to restore the distorted image on the saucer, tell your beloved one the voice of your heart. 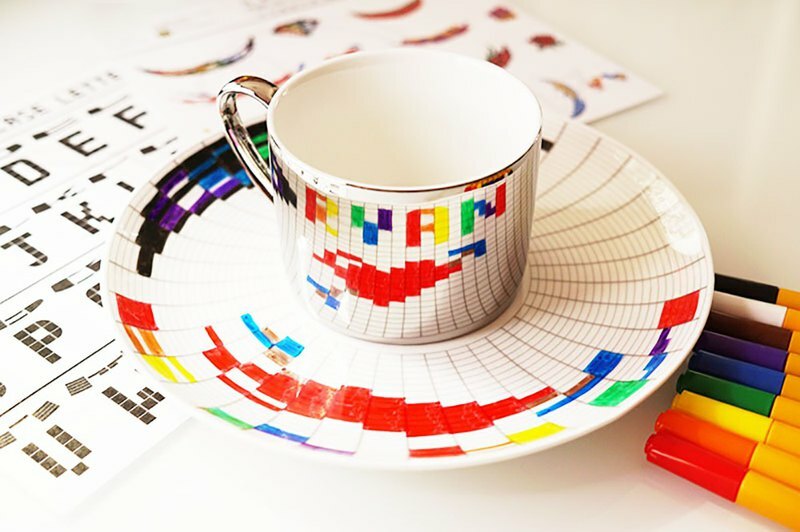 Mirror Anamorphic Cup and Saucer Series - Make your Own Secret Message Cup and Saucer, unleash your creativity! Use the mirrored cup to restore the distorted image on the saucer, tell your beloved one the voice of your heart. Included in the box are alphabet and image samples (both in normal and distorted versions) for your reference, you can easily draw your design on the grid saucer and reveal it with your mirrored cup! **This set includes:** Instruction Manual -	alphabet samples in normal and distorted versions -	image samples in normal and distorted versions -	Ceramic pens instructions -	Important Notes Ceramic Pens (9 colors) Mirrored Cup Bone China Saucer **Ceramic Pens Instructions:** 1.Draw design on grid saucer using ceramic pens in assorted colors. 2.Use wet cloth to remove mistakes drawn on the saucer. 3.Allow design to air-dry for 24 hours. 4.Bake in the oven for 20 minutes at 150℃. 5.Let the saucer cool before removing from the oven. Diameter of cup: 8.5cm Diameter of saucer: 20cm A box and shock absorber pads are also included.